Disclaimer: I plan to write about my adventures and daily experiences as a Type 1 Diabetic, offering stories, tips, and questions to ponder. I do not consider myself an expert in anything that I can think of right now, nor am I certified or any type of authority on backpacking, paddling, or any other activity I may write about. So, in the words of LeVar Burton, “Don’t take my word for it.” But, enjoy reading and feel free to share your experiences so we can all understand that everyone’s life is an adventure of adaptation and acceptance! Blogging is the perfect activity after hiking 35 miles in two and a half days. It takes a lot for me to be mellow enough to just sit down for awhile. My blood sugar dictates my activity level quite frequently; if it is low I’m making a snack, if it is high I’m putting on my running shoes to go exercise it down. But today is a rest day, no matter what it says, because my legs are sore. That being said, the main inspiration for this blog is the place of acceptance I’ve finally reached where diabetes is not my enemy, it is just my life, and by choosing to embrace it I can live joyously, safely, and fully. My backpacking partner Jamie and I left our Asheville homes on Saturday headed for the Nantahala Gorge where we would leave Loretta (my faithful golden car) and travel onward to Franklin, NC to sneak into the woods and onto the Bartram Trail. William Bartram was a Philadelphia native born in the 1700’s who hiked along the Appalachian mountains botanizing, sketching flora and fauna, and writing of his experiences. The trail with his namesake runs about 115 miles from the mountains of North Georgia into our North Carolina mountains. We chose a chunk of it that spanned several ‘balds’ and meandered through stretches of deep wilderness before it crossed dirt and paved roads. Before we left, I packed. I plan on making a separate article that covers my usual gear and method of packing for normal days as well as adventure trips. For this trip I made sure I had plenty of warm clothes since higher elevation would mean lower temperatures and October can be pretty chilly in the mountains anyway. I also made sure I had my key diabetic supplies and back-up, as well as double the carbohydrate rich food I would actually need to bring up low blood sugar. Supplies and full tubes of honey do add pounds to your pack, but the security of having back-ups is well worth the extra weight. Also, honey is just about the most delicious energy goo to squeeze into your mouth before hiking up a steep mountain and always strengthens my resolve. The weather was beautiful – perfect I’d venture to say. The first day and a half there wasn’t a cloud in the sky and the last day the clouds only made the mountains more dappled and depthy. We built a crackling little fire both nights but my fears of being cold were never justified. The second night I did put on my long underwear, a vest, a jacket, my hat, and two pairs of socks, but this was mostly just because I wanted to wear all the clothes I’d been carrying. Jamie stayed in shorts and t-shirt. I do find as a diabetic I am suddenly cold-natured, where as before diabetes I felt like I stayed uncommonly warm. Luckily this means I have more excuse to wear the wonderful fleece hat I just bought that is made by a company who “upcycles” wool sweaters into cute little tobaggans hats. I told Jamie about the blog idea and he suggested a “D Scale” to rate experiences based on their difficulty in relation to diabetes. This trip I would say rates a D5. Although on my personal “K Scale” 35 miles in 2.5 days rates a K8.5, I am getting better at managing my blood sugar in relation to backpacking and at feeling secure in my packing and planning skills. My first backpacking trip was probably a D9 if you factor in my fear of forgetting supplies and the stress of not knowing how I would adjust my insulin for the extra carbs in backpacking food or the sustained activity level. Now I anticipate one or two nights in the woods as a precious escape from the paved life I lead even in the wonderful city I call home. We hiked about 6 miles the first day, setting up camp at the second marked site at the low-point of a valley a few hundred yards from a tiny water source. I was worn from the steady uphill but enthusiastic about a hot meal of dal makhani and green beans from a couple of cans we’d brought along. Jamie fired up the campstove and I got our supplies out, manuevering the funny little can opener we bought for a dollar and then checking my blood sugar. A little low. I’ve tended to spend the majority of our time backpacking a little on the low side. I usually cut my insulin in half or reduce it even more. For this dinner I took three units less than I would have at home since I’d been walking for hours and revving up my metabolism. Hot lentils in the woods is a pleasure. For someone whose life revolves so much around food, I might look forward to backpacking meals even more than dinner at home. We added fresh basil and parsley to our pot that I had brought from the yard garden. After a satisfying and restorative dinner we relaxed by the fire and listened to the waning insect chorus of autumn. A mystery that may never be solved had me a little on edge the first evening. Everytime an acorn would fall in the quiet forest its loud boom would spook us. During the vibrant summer we could not have even heard acorns falling for the roar of cicadas and katydids, but now we were listening for every crack and thud in the forest. I was spooked already from earlier in the day when Jamie stopped ahead of me in the trail to stare and mumble about something at his feet. I asked him what the matter was and he told me I’d see, and when I reached him I understood his pause. In the middle of the trail was a black glove, dirty and worn, and on either side of it evenly spaced and aligned were three torn pieces of used toilet paper. It was some strange marker, probably by a teenage boy who was going for the gross factor, but still a little unsettling. Something about it was ominous enough to make me snuggle my sleeping bag closer to Jamie’s and stay alert until I could not resist sleep any longer. The morning was fresh and calm. We pumped more water from the stream, walking back through lemony groves of some plant that was taking over the abandoned logging road near our little creek. I had cut my long-acting insulin down by one unit anticipating a heightened metabolism and busy next day, but still awoke a little low. The hardest hiking of the weekend was on the way back from the stream before we’d boiled water for coffee. If you’re addicted to coffee in your normal life, you will still be addicted in the woods. Don’t forget it or decide that it is a luxury. My dear friend gave me a small Maxwell House instant coffee before my birthday backpacking trip earlier in the summer, and now I crave its strange smokey taste while I’m in the woods. Granola bars, turkey jerky, and a cup of coffee later we were trudging up the hill. The most beautiful vista was at lunch time on top of Wayah Bald that we had spent that morning hiking up. It was a steep 5.5 miles but we were rewarded with a panorama of orange and green mountains. After hiking away from the observation tower we lunched at a family picnic site set into the trees where a group was celebrating October birthdays and we could set our stove on a flat surface to heat a little water for our powdered hummus. I find that while maintaining constant movement and carrying a 30 lb. pack I can eat just about like anyone else and take less insulin while I’m at it. Jamie is an understanding partner and enjoys low-carb tortillas with me, but he did buy a jar of Nutella to accompany our little adventure, and I have to say, a “Backpacker’s Nutella Crepe” is almost reason enough for a diabetic to hike 5 miles before lunch. We take low-carb spinach tortillas, I’ll give you the exact brand in a ‘foods’ post, and fill them with hummus, basil, turkey jerky, carrots, or whatever else savory we bring. Then for dessert it is Nutella and dried cranberries with a few walnut pieces wrapped in low-carb whole wheat tortillas. Que rico. I cut my insulin dose in half, and still by four miles after lunch I was low again. Camp the second night could not have arrived at a better time. I was on the verge of sitting down in the middle of the trail and staying through the night, but Jamie the map-champion attested we were “So close,” to our designated spot. We found it and water nearby again, as well as a view of Nantahala dam. We had walked 16 miles in a day, up one bald and over several more to reach our site, and wearily we collapsed onto the soft pine-straw earth. About an hour before we reached camp Jamie began what I like to call his “Chili Mantra.” It always starts a little while before we end the day of walking, very intermittently at first and escalating in frequency until its quite regular. We will be walking along in silence, either to tired or absorbed in the rhythm of walking to talk, and he will just shout, “CHILI.” Sometimes with longing, sometimes with exhaution, sometimes almost demanding it. I know we are close to camp when he says it with a hint of desperation. That second night we did make a big, bubbling pot of “Darn Good Chili.” This particular “Bear Creek” brand is well balanced between carbs and fiber and is fat free. We add one small can of tomato paste and seven cups of water to the lightweight packet of dried chili to make a delicious meal perfect for eating with Dr. Krackers as edible spoons. Jamie started building a little teepee fire out of pine wood which smoked instead of burning, just like my grandpa always said it would. We found some nice hardwood to burn and had another night next to a warm fire. I slept like a big ol’ fallen log that night but it was Jamie’s turn to be on edge. He reported the next day that he stayed awake for hours listening for bears and creatures. He told me that he wanted me to tell our friends that he had to fight a really big bear and that he scared it so bad that it would never mess with humans again. So that is what happened while I slept. Morning broke the darkness with far more energy than I felt. Jamie shouted for me to get up and I shouted back that I needed coffee, so he started the water boiling. Once I felt like coffee was well under way I crawled out of the tent to greet the cool morning air. Breakfast was a couple of instant oatmeal packets from a company that uses organic grains and chunks of dried apple and adds very little cane sugar to the individual packets. I added in dried cranberries and walnuts for energy and protein. Before hiking I checked my blood sugar and it was really high, like 346 high. I couldn’t eat like everyone else! I took 1.5 units of insulin and then started walking. In an hour I was low again. The back and forth of highs and lows in hard on a backpacking trip. It is important to check your blood sugar often, even if you feel distinctly low or high, exhaustion and previous fluctuations can affect your blood sugar intuition. I like to eat a meal and guess at a reduced dose of insulin and then hike for an hour or so before I check unless I feel low or strange in some way. Checking right after eating can lead to false conclusions since a steep trail can bring blood sugar down fast and insulin might take a few minutes to kick in but then hit suddenly with increased activity level. Another positive for me is an understanding partner who prioritizes my need for monitoring and snack breaks as much as I do. Jamie packs a glucagon kit and we’ve gone over how and when to use it. He carries extra snacks and encourages me to take breaks to manage my blood sugar whenever I need them. If you are not blessed with such an understanding partner and are managing diabetes within a group, you must advocate for yourself when you need to stop and prioritize your condition even if it means your experience and needs differ from that of other individuals. The more you ignore the requirements of diabetes the more it will limit you and stress your mindset. I have finally realized that if I embrace the changes and adaptations diabetes requires and really prepare, I feel healthier and more free to enjoy my experiences. Our last day in the woods covered 14 miles through golden forests of beech trees and huge chestnut oaks intermixed with smaller sourwoods bearing bright red flags of fall. We climbed steadily up Rattlesnake Bald through quiet, peaceful forests interrupted occasionally by a drumming quail or the wooshing flight of a hawk. At one point Jamie was up ahead, looking a little bit like a bear lugging his black backpack, when a gust of wind unhitched a wave of crisp golden leaves from their trees that twirled down all around him in the most magical way. A smile overtook my face and stayed there for a mile afterwards. We ended the day in the woods at the surge tower above Duke Energy’s Power Plant beside the Nantahala. From the base of the tower we had a view of Cheoah Bald and several other mountains we’ve promised ourselves we will climb. 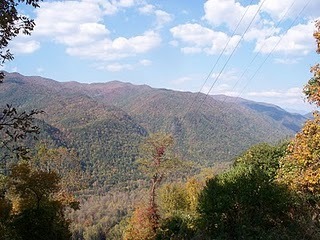 The woods had rusted even more orange and red since we started and the mountains looked welcoming and so alive. From this last view we had only to tramp down a dirt road, coming out at the power plant and then walking down a paved road to the parking lot where Loretta faithfully waited for our return. Posted on February 3, 2014 February 3, 2014 by thesweetadventurerPosted in TheSweetArchivesTagged backpacking, type 1 diabetes. Next Next post: Working the Dinner Shift on a Saturday = D9!